This year our annual golf tournament will be on Thursday October 18th at North Fulton Golf Course (Chastain Park). Sponsors and golfers enjoy a great day of golf, networking, gifts, prizes, beverages and meals throughout the day, and a wonderful golfers’ reception. Mark your calendar and get ready for the biggest and best blowout ever! Get ready for the biggest and best golf tournament we’ve ever had. 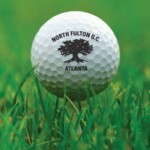 This year the tournament will be on Thursday September 17th at North Fulton Golf Course (Chastain Park). 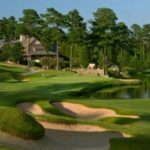 Mark your calendar and save this date for our annual golf tournament to be held on Thursday September 18, 2014 at North Fulton Golf Course (Chastain Park). If past history is any indication, we are sure to have fabulous weather and a great day. Announcing the date for our annual golf tournament to be held on Wednesday September 25, 2013 at Heritage Golf Links in Tucker. Mark your calendar and save this date! If past history is any indication, we are sure to have fabulous weather and a great day. 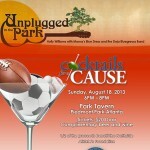 Mark your calendar now t join us for our second Cocktails for a Cause event at Park Tavern (at Piedmont Park) on Sunday, August 18th at 6:00—8:00 PM. This concert is sure to be a great time featuring live music by Holly Williams (Hank Williams’ granddaughter) with Mama’s Blue Dress and Deja Bluegrass Band. Admission $20 at the door, includes complimetary Beer and Wine. Summer is here and it’s time to cool off, relax with a cocktail, meet some new friends, and help raise money for a great cause! 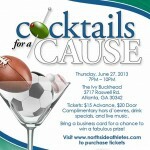 Please join us for a party at the Ivy on June 27th @ 7:00 to benefit the Northside Athletes Foundation.